A car that dares to go in a different direction. Because it knows that's the best way to become the only one. A piece of innovation made by the Fluidic Sculpture, the very philosophy of Hyundai itself. 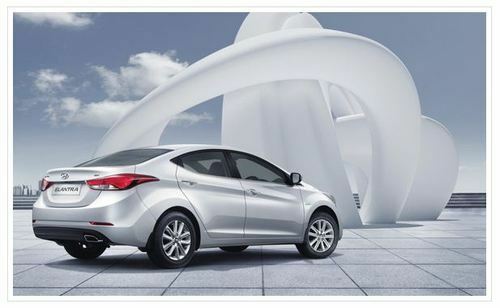 Sporty front, splendid rear and every facet so original, you just can't help being charmed by Elantra. Both pertrol and diesel engines are shaped to change the way you look at driving. These silent and efficient engines offer you the perfect drive each time. It comes with 6 airbags dual front airbags for the driver and passenger plus dual front seat-mounted airbags and dual side curtain airbags which offer additional protection against side impacts. With seats ventilations you will feel fresh even after a longer trip. Optional fans in the cushions and the back of the front seats absorb and ventilate the air inside the car to provide a pleasant ride. If you find yourself feeling excited looking at the Elantra's side character lines, muscular wheel arches and lower roofing,don't worry It's a common side effect. The interior design is roomy, comfy and confident, setting new industry standards for the basic layout of a car and the execution of details. The Elantra delivers in power, efficiency and styling. But what makes this car even more appealing are the luxurious and innovative features that blend seamlessly with all black interiors that this car boasts off and lots more..